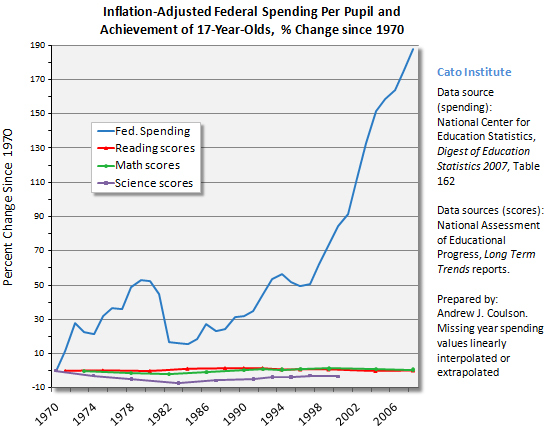 The chart below, from the Cato Institute, shows how massive increases in federal spending on education have done nothing to improve education results since 1970. When people discuss our public school system, the discussion usually hinges on how much more money the federal government should spend to improve education. Instead, we should be asking a different question: “Why should the federal government be in charge of education at all?” Why should we take money from taxpayers in the various states, send it to Washington DC, use a good chunk of that money to pay bureaucrats to slap a bunch of stipulations, regulations and mandates on whatever remains, before sending it back to the states to fund their schools? And besides, unless my copy is missing a few pages, the Constitution provides no authority to the federal government to manage education. When I ask people that question, the only answer I get (in one form or another) is that some states might not do a good job. They say that poor states may not spend the money needed to properly educate our kids. Or, they say that states might teach different curriculums which would make things uneven. I’ve even heard more than one person suggest that Southern states like Alabama or Georgia might reverse 50 years of integration and return to some sort of Jim Crow, separate but equal, whites only drinking fountain, backwoods school system. Really? The question really boils down to whether we want a centrally controlled, one-size-fits-all education system, or a system where we have more local control of how we educate our kids. Without federal mandates on education, each state would be free to determine its own educational policies. As former New Mexico Governor and current Republican Presidential primary candidate Gary Johnson likes to say, “Fifty laboratories of innovation.” What he means is that each state would take different approaches to education reform and the best practices would be emulated, and the failures would be abandoned. Some states may emphasize standardized testing and curriculums. Other states may let the school districts set policies. Some states might institute a voucher system to allow parents to chose where their kids go to school and force schools to compete for their business. What’s the best solution? I don’t know (although I have my suspicions). The point is, bureaucrats in Washington DC don’t know either, as evidenced by the chart above. It’s time to get the federal government out of education and give the power back to parents and teachers. This entry was posted in Chart of the Week, Education and tagged CATO Institute, education, education spending, education spending chart, government schools. Bookmark the permalink.